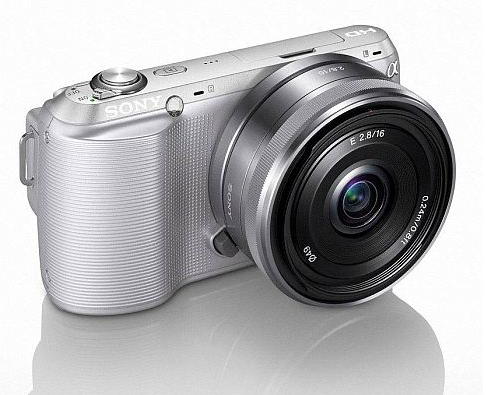 Sony's latest mirrorless camera, the NEX-C3, is touted to be the world's smallest and lightest interchangeable lens camera. Sony said the reduced physical size of the NEX-C3 has made the camera very light - it weighs 225g which is about 6% lighter than the NEX-3. It also has a rounded design and a streamlined grip shape for easy handling. Additionally the NEX-C3 has a tiltable 3in LCD screen for composing shots at different angles. On the inside, the camera has a large APS-C sensor that takes 16.2-megapixel pictures with quality that is on par with a regular DSLR camera, Sony claimed. Aside from that it also records 720p HD videos. The camera will come with a new Photo Creativity interface that has simplified photography terminology for novices, though the traditional interface for aperture/shutter priority and manual functions are still available for experienced users. There's also a new picture effect setting that lets users preview a variety of effects like Toy Camera, Pop Colour, High Contrast and Posterisation before snapping the picture. On top of that, other notable features include 3D sweep panorama, Auto HDR, Handheld Twilight and Anti-Motion Blur. The NEX-C3's battery has also been improved to offer 400 shots per charge. The camera will be available here next month but no official price has been announced yet.